Winner of the 2000 Oofuji Noburou Award at the Mainichi Film Awards. 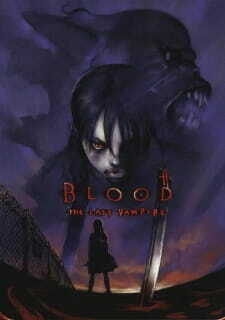 Blood: The Last Vampire represents something of a departure for Production I.G., and for anime as a medium, not in terms of plot or characters, but in terms of production. Traditional animation techniques were replaced completely by digital animation, whilst the character designs lost the standard "clean and simple" line structure that has been a mainstay of the animation field for many years. In addtion to these, the movie was also a departure in terms of audio, in particular because of it's dub, and also because of it's target audience (more on these points in a bit though). Plotwise this is actually a rather enjoyable romp in the realms of fantasy action. Being an original concept, rather than a remake/re-envisioning/adaptation/copy, the writers had the advantage of being able to tailor the plot any way they wanted to, and with director Kitakubo Hiroyuki having artistic license with the material, it's only natural that Blood has an experimental feel to it at times. The story moves along from start to finish at a fair clip and, whilst there is very little in the way of background detail, what information is imparted to the viewer is done so in the same direct manner I mentioned earlier. There isn't really any beating about the bush here, which is refreshing to see, however the movie does have some problems here and there with it's plot, the main one being that it simply peters out instead of reaching a proper conclusion. This can give the movie an unfinsihed feel, and can make the viewing experience unsatisfying for some people (although I don't see it as a problem - explanation later on). As I've mentioned already, Blood was made using techniques that were a clear departure from standard anime practices, but what does that actually mean anyway? In the simplest terms, Bood is a visual feast. The use of digital animation over tradition cel based methods means that the movie can run at a higher speed than normal. The result of this is that the animation is far more fluid than it would normally be. Likewise the "rough and ready" design of the characters, in particular the adoption of rough lines over smooth with character features and clothing, adds a far more natural element to the overall product. These two factors, when coupled with the movie's low-level of lighting and muted colour palette, produce some startling on-screen effects, in particular a kind of natural "motion blur" (ask me if you want an explanation). The movements of the characters and the Chiroptera are extremely natrualistic, far more so than one would expect. The use of rough lines also manages to convey a depth of emotion from the characters that is just not possible to achieve with clean, simple lines. Terada Katsuya, the chief character designer, explained in an interview that the use of rough lines in the movie was to reflect the fact that there are no clean and simple lines in real life. The movie uses this fact to provide characters that have some of the most expressive features I've seen in anime. The other area of departure was in the movie's audio department. Blood, unlike other anime before, was made to have an English dub with Japanese subtitles (making it the first anime to do so). Production I.G. had made their target audience the Western anime markets and they had to make the movie appeal to Western fans. Ironically, the dub is also one of the reasons why the movie became a hit in Japan. Most Japanese fans found it a novel experience to watch an anime that was clearly Japanese, but in English with subtitles. Aside from the dub, the sound effects were truly astounding. The various crashes and bangs, the sickly, fleshy noises, the whines and screeches, and more besides, are all lovingly realised. The atmosphere is positively littered with noise of one sort or another, with no scene being truly silent (even though it may initially sound that way). This lends a depth to the overall atmosphere of the movie, and highlights the fact that whilst Saya may be fighting otherworldly creatures, the rest of the world is proceeding as normal. Musically the movie is actually pretty good. What music there is, is often atmospheric, but muted to a degree so that it doesn't impact too much on the scene. This is a pretty effective way of heightening the tension, and whilst it's nothing new in terms of visual media, it's nice to see the technique used to good effect here. Blood: The Last Vampire may be a visual and aural triumph, however this has come at a cost. The characters are individuals to a tee, however they are also one dimensional. The movie is very short, so there is little room for character development in any way. The viewer is given some hints about Saya, but these are nowhere near enough to satisfy the diehard character junkie. Everyone else though, will simply ignore this in favour of watching some great action. I, personally, think that Blood: The Last Vampire is one of the unsung heroes of modern anime. Not only does it have some of the best action available in the medium, it also pioneered several techniques that have become standard practice in the industry. The movie has received phenomenal success both in Japan and abroad, garnering numerous awards and accolades along the way. That doesn't mean that you'll enjoy it though. Because of the problems it has with it's characterisations, and the story that doesn't really go anywhere, it would be easy to say that this movie is nothing more than a glorified advert for the manga and light novels. This is a justifiable perspective, however I think that rather than focusing so much on those issues, one should simply watch this as if you were watching Die Hard, Lethal Weapon, any Schwartzenegger movie, Rambo, etc. This is actually the best way to fully appreciate the movie in fact, as it isn't meant to be a cerebral effort, but an entertaining one. If you haven't watched Blood: The Last Vampire, then you may be missing out. This is an iconic anime that pushed the boundaries of the medium, as well as reminding Western studios and critics that anime was coming of age. I found this to be a most enjoyable fantasy action romp that didn't require any deep thought or introspection. In the same direct manner of the movie, it did exactly what it set out to do. It entertained me. Nothing more, nothing less. It felt like I walked into the theater 15 minutes late, then part way in I forgot I had to be somewhere and had to leave 15 minutes early. The animation and art design is quite nice, but the lack of character development and very minuscule plot left me feeling so bewildered and confused - I still don't understand why this was apparently so popular at the time it came out. This is a great anime for vampire lovers. The ending as is to be expected is pretty open-ended, although Blood+ can give you an additional fill if you want. Over all this OVA excells. The story is so well-written, it might not have that much in the way of character development due to how short it is, but the way they present the vampires is very believable, the director himself stating how he wanted to present vampires as in-between evolution, something few anime do, or overdue as is the case of Trinity Blood, where there is evolution, but it is accompanied with near magical powers. Blood has none of this. The transformations are gruesome, and the end result a bat-like creature not unlike the one found in Batman. This is why the story and animation are great, they pull out all the stops to present this version of chiropterans (vampires) as something that might indeed exist. The main character is silent, so in terms of sound there isn\'t much to say about her, but the screams of the chiropterans can be to some bone chilling, and the dialogue wastes no time ensnaring you in the story, with pretty well cast voice actors, and an ocassional scene thrown in to leave you confused and wanting more, you\'ll know when and if you have seen it, particularly towards the end. One of the most impressive animated films in 2000, garnering a Grand Prize at the Japan Media Arts Festival, Blood: The Last Vampire is a beautiful dark anime that is lauded for its extravagant production values. But, of course, when the animation studio has the caliber of Production I.G. In the beginning, we are introduced to Saya on a deserted train. She sits very still, unmoving. Then all of a sudden, the train stops and the lights go out. What follows next is a one-minute action sequence that is guaranteed to take your breath away and give you an idea just how bloody marvelous this film is when it comes to top-notch animation quality. And as though recognizing that this is, in fact, the film's main draw, the makers do not scrimp and we all get treated to fabulous shots that are pure animation genius. Story-wise, the film falls a bit short. We don't get to find out what Saya's real nature is or why she does what she does. Admittedly, the film does not explain a lot of things about itself. Much is merely suggested and audiences are often left to speculate and figure things out for themselves. Because of that, the entire film feels like an hour-long teaser trailer. A beautiful, 2D-3D film quality, mind-blowing trailer, that is. And in a way, it is only just a trailer, as more of Saya's story is expounded on in a later spin-off series, Blood+, another Production I.G. masterpiece. All in all, Blood: The Last Vampire makes for an entertaining visual dessert. All sweets and sugars but very little body. I kind of like it because of that. Saya from BtLV and Saya from Blood+, the same person?